Noli Braddock and her best friend V’s incident with a flying auto have landed them in a heap of trouble. And when Noli is sent to a spirit-squelching reform school in San Francisco, she’s sure that her rebellious adventures are over. Meanwhile, Kevighn Silver has been ordered by the Faerie Queen to bring a mortal girl back to the Otherworld. The magic requires a blood sacrifice every seven years, and only a mortal girl who shines with the Spark—a girl like Noli—will keep the Otherworld from complete destruction. When an ill-timed wish sends Noli tumbling into the Otherworld, she’s more homesick than ever . . . until V arrives to save her from an untimely demise. But who exactly is V? And if he helps Noli escape, who will save the realm of Faerie from utter annihilation? Thanks ATWAT for the book! Innocent Darkness is a story about a girl named Noli, who is nothing like the proper lady of her time. She is rebellious, fun seeker, who rather tinker under a flying car than wear pretty dresses. Despite her social status she is best friends with Steven Darrow, otherwise known as V and she constantly gets him in trouble. When a joyride is caught by the police Noli is sent to a boarding school to “fix” her ways. Separated from her best friend and her mother, Noli must fight the pressures of the boarding school and discover for herself who she truly is. The boarding school is not what it seems and for Noli that’s where the adventure begins. There is so much to say about this book. 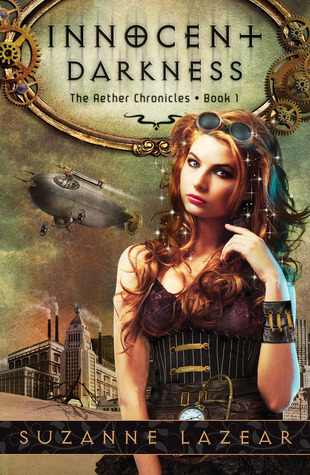 I’m still in the beginning stages of loving steampunk and I wasn’t sure how I’d feel about this book but I really wanted to give it a try. I wasn’t disappointed!!! I loved Noli as a character. She has a lot of growing to do, and she constantly has to prove to the world that staying true to herself is the best option. She goes through many changes throughout the book but she continues to portray her strength and never giving up. It takes her a while to figure out her feelings on some matters which in itself is sweet and realistic. Speaking of feelings, there’s V.
I adore V’s character to pieces! From the beginning, I knew there was something about him that’s going to capture my heart. Sure, I felt for Kevighn at times but V has truly won my heart. He is such a sweet, unexpected hero that it makes me squee with happiness anytime he comes across the pages. I love his friendship with Noli and how he makes her a better version of herself. The ending took me by surprise! I literally grunted at some things in the last pages. The aspects of Noli that I loved so much are taken to the highest test and I’m really curious to see how book two and three are going to play out. Nervous? Yes. Excited? Most definitely! Suzanne creates a world that is so real it could be the one we read about in history books. Full of memorable characters, fascinating plots, and flying contraptions (yes, I had to throw that in) Innocent Darkness is a beautiful debut! It comes out August 8th, 2012! I would love to hear your thoughts! ← "Much Anticipated Books" – Book Haul! This looks like a great book I can't wait for it to come out!